To view our inventory of very rare contemporary pre-owned premium brand sextants, click here! 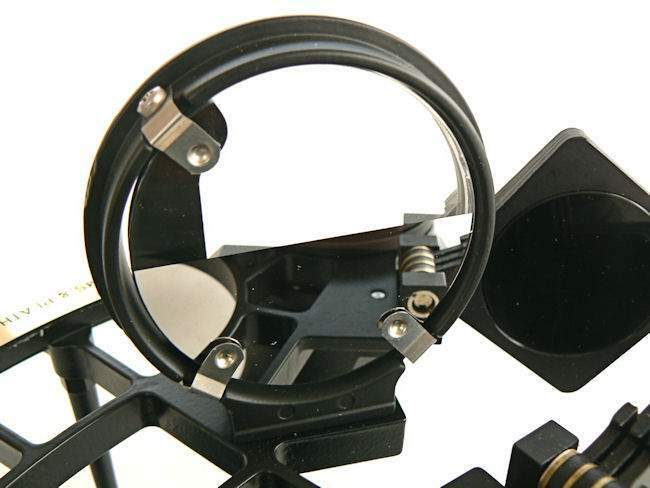 This Very Rare Sextant Has Been Sold. Thank you! Presented is the second example of this exact model Carl Plath sextant we’ve seen since it's introduction in 1991. It is in "Collector Quality" condition, and appears never to have been used. 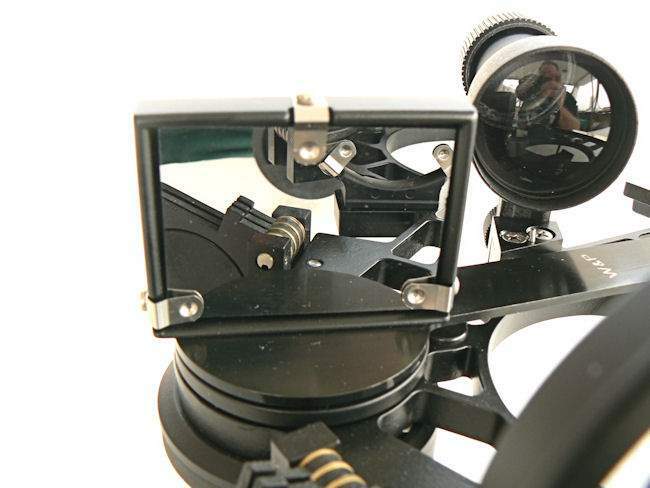 This model sextant is fitted with over size mirrors, a quick focus telescope, and a rotating vernier to adjust index error to zero on the scale. The quick focus is done by moving the ocular lens in and out rather than turning it. In 2006, we sold the first C. Plath Navistar “TRADITIONAL” sextant, Serial No. 64251 and this one is 64346. The two are identical except for the telescope. See http://landandseacollection.com/id222.html for the sales listing. This is the first we've seen since then. Next to the C. Plath “Royal”, the Traditional was the last new, high quality, model Plath introduced. Both date back to 1989, just 12 years before Plath's sextant production ceased. Don't confuse this sextant with the Navistar Classic which had a "ladder" or "web" frame, and was made in much greater numbers. Based on the scarcity of the TRADITIONAL, very few exist, and even fewer of this variation. DESIGN FEATURES: The Navistar Traditional, is second only to the Navistar Royal, in Plath's line of premium sextants and was made in limited quantities. Because it was a new design in 1989 with many advanced features, it sold for more than other sextants. The Traditional's visual clues are the Circle frame design, and the special micrometer drum with a rotating vernier, newly designed telescope and the usual Navistar brand imprint. The rotating vernier has six indents and reads to 10 seconds of arc. You turn it to match the "0" point with the "0" on the micrometer drum so that index error reads zero. This example has the exact same features. It comes with its original detailed instruction booklet. 90680. C. Plath quit producing sextants around 2001. The parent company has completely liquidated everything including machinery, equipment and spare parts. CONDITION: Appears to be Brand New and never used. It operates like a well oiled piece of machinery, with NO faults even minor ones. Both mirrors shows as NEW. The illumination works. The bronze arc shows "as new". There is no index or side error. There is no certificate which is not uncommon, and unnecessary in C.Plath sextants since they were all built to a tested accuracy of 20 arc seconds or less. For practical purposes this makes them error free in use. The high gloss case case has a couple of minor scratches and other marks from handling, otherwise it to is perfect. Two keys are included. STAR RATING: This super fine Collector Quality instrument rates FIVE PLUS STARS irrespective of age. In 1962 C. Plath was acquired by Litton Industries, a large American concern.The C. Plath North American Division was set up in 1978 in College Park near Washington. 1996 saw the introduction of the world's first fiber-optic solid-state gyrocompass by C. Plath. The first ever gyrocompass with no moving parts. Sperry Marine was formed in 1997 with the combination of C.Plath, Decca Marine and Sperry Marine with more organizational changes yet to come. After 163 years, C.Plath changes its name to Sperry Marine in May 2000. In 2001 Sperry Marine becomes part of the Northrop Grumman Corporation. Index Mirror: 60 x 44.5 mm. aluminized on the rear side. Weight sextant: 3.5 lbs, Weight case 5.3 lbs. QUALIFICATIONS: We are one of the few companies still selling navigation instruments that know anything about them. For purposes of judging whether Joel's opinion counts, he was the editor of the chapter on sextants of the 1977 Edition of "Bowditch", The American Practical Navigator, NAVPUB 9; a member of the U.S. Naval Academy Navigation Symposium Board, 1975 -1978; the author of a book on marine sextants, Cornell Maritime Press,1975, and the founding president of Nautech Maritime Corporation which partnered with Tamaya of Japan in the introduction of the MS 733 Spica, the MS 833, Jupiter, MS 933 Venus sextants and the famous NC-2 navigation computer, in the U.S. market. Joel is a retired Master Mariner, and held a U.S. Navy "D" Qualification as a Senior Skipper - Oceans. From 1995 until 2001, he was a Varsity Offshore Sailing Team Coach at the U.S. Naval Academy. International buyers welcome, but must inquire first. We have satisfied customers in Argentina, Australia, Austria, Belgium, Bermuda, British Virgin Islands, Canada, Chile, China, Czech Republic, Democratic Republic of Congo, Denmark, Estonia, England, France, Germany, Greece, Holland, Hong Kong, Hungary, Iceland, Ireland, Israel, Italy, Japan, Kuwait, Latvia, Luxembourg, Martinique, Mexico, New Zealand, Norway, Nova Scotia, Panama, Poland, Portugal, Puerto Rico, Romania, Saudi Arabia, Scotland, Singapore, Spain, Sweden, Switzerland, Thailand, Turkey, United Arab Emirates, USVI and the Eastern Caribbean.